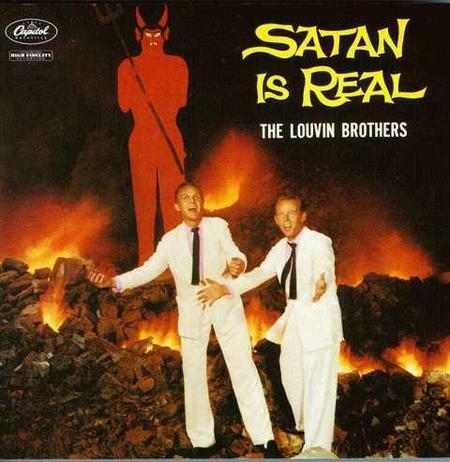 My first exposure to the Louvin Brothers was on one of those “worst album covers of all time” Web sites. Standing in front of what appears to be a backyard BBQ gone horribly wrong, two Bing Crosby wannabes in matching white suits raise their arms in welcome. Above them, the title proclaims “Satan is Real.” Behind them, the most ridiculously fake, wooden Mephistopheles looms like failed a junior high shop class project. “Do you mean the Loooovin Brothers,” he asked, making a point of drawing out the long “o” and informing the store of my ignorance. “Um, yeah, whatever,” I stammered. They were out. Sometime after that, I happened upon a CD of “Satan Is Real” at the Kansas City Public Library. After mocking its cover for so long, I had to hear what the actual music sounded like. Pretty freaking good, it turned out. Charlie and Ira Louvin’s music wasn’t the kind I wanted to listen to that often, but when the mood hit it landed deep and only the Louvins would do. As if by magic, their names started appearing in the album credits of my favorite musicians – the Byrds and Gram Parsons, Emmylou Harris, Johnny Cash, Buddy Miller, Uncle Tupelo. Far from a novelty act or wacky cover, the brothers’ influence was everywhere. A couple years ago, a friend lent me his copy of the Louvin Brothers Bear Family box set. At eight discs it was way more than I’d ever need, but he swore it was the best stuff ever recorded. I respected his deep and diverse tasted and promised to dive in. I’ll now confess that I only just scratched the surface. A little country gospel still goes a long way for me. This same friend also told me about the time he saw Charlie played the Grand Emporium. Only a few people bothered to show up for the full set peppered with stories and a fond remembrance of Ira, who died in a car crash near Jefferson City, Mo. in 1965. Afterward, Charlie hung out, reveling in conversation with his fans. I made a mental note to see Charlie the next time he came through town. His next appearance was opening for Lucinda Williams. It was a dream ticket, but I had other obligations that night. Then were appearances booked at Knuckleheads and Davey’s Uptown. Just before the show, however, the performance would be cancelled. Then, miraculously, another date would be booked several months out. Each time a show was cancelled I feared that I’d missed my chance. Wednesday my worries were confirmed: Charlie Louvin died from complications from pancreatic cancer. He was 83.